The Isle of Mull, just a short ferry ride from Oban on Scotland's west coast, has much to offer the walker, as well as wildlife watching opportunities for those quieter, less energetic days. 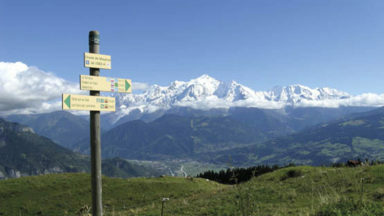 Cicerone author Terry Marsh shares some of the sights that have delighted him. At the northernmost tip of the island of Mull, at Ardmore Bay, is a small hide, tucked neatly into the landscape, looking out across the Sound of Mull to the great wedge of Ardnamurchan, the westernmost point of the British mainland. Few people come to Ardmore; it's a walk of a few miles from the nearest parking area just off the Glengorm road, but come rain or come shine, we've never been disappointed. In recent years a lot of the forest has been clear felled, opening up to view the ruined villages of Ardmore and Penalbanach, poignant reminders of families that lived a harsh life here. Warmly ensconced in the hide, we rove our binoculars back and forth across the Sound, watching gannets and Arctic tern plunge into a smooth-surfaced sea above which guillemots zipped low and urgently, while a mature sea eagle circled for ten minutes above the lighthouse at Ardmore Point. He would have a mate not too far away, more than likely sitting on eggs; it was that time of year. Slowly, our attention was drawn to a dark line rippling across the surface of the bay: a raft of seaweed, or a floating log, at a guess. But then it started to change direction, and we knew that an otter, and then another, had come to visit. For some inexplicable reason – they were still a quarter of a mile away – we held our breath, not daring to say anything...just taking it all in. It was the simplest and most endearing of theatrical performances, with a walk-on part for an immature heron. For half an hour we watched as the otters came ashore and scrambled among the seaweed-covered rocks along the shoreline, pausing to snack on a small crab or fish, until, finally, we decided they had moved on, back out into the bay and around the coast through Bloody Bay and south towards Calve Island and Tobermory, no doubt. Increasingly, sightings of sea eagles, more properly known as white-tailed eagles, golden eagles, and buzzard are a feature of most days on Mull, but there are hen harrier, too, kestrel, merlin, short-eared owl, peregrine falcon and osprey. On the lochs great northern diver often arrive in winter, along with Slavonian grebe, barnacle and white-fronted geese, while the breeding season sees significant numbers of guillemot, puffin and gannet on and around the off-shore islands. Mull, you soon realise, is a place of wild beauty: feral, rocky and never dreary, even on a dreich day. Great swathes of Mull are accessible only on foot, and while roads there are, the enduring impression is that they are incidental to life on the island; a sop to mankind. Separated from the Scottish mainland by the Sound of Mull and the Firth of Lorn, Mull, with an area of just under 90,000 hectares, is the fourth largest of the Hebridean islands, framed by a coastline deeply penetrated by a ragged 480km (300 miles) of sea lochs and inlets. This is an island of enchantment and considerable diversity. Indeed, the coastline vies with the mountainous heartlands as the island’s most outstanding feature, offering towering cliffs and sandy bays, basalt columns and pink granite crags. By eagle-wing, Mull stretches 44.5km (28 miles) from Ardmore Point in the north to Rudh’ Ardalanish in the south, and 49km (30 miles) from Duart Point in the east to the coast overlooking Iona in the west. But such statistics are meaningless in this contorted landscape. 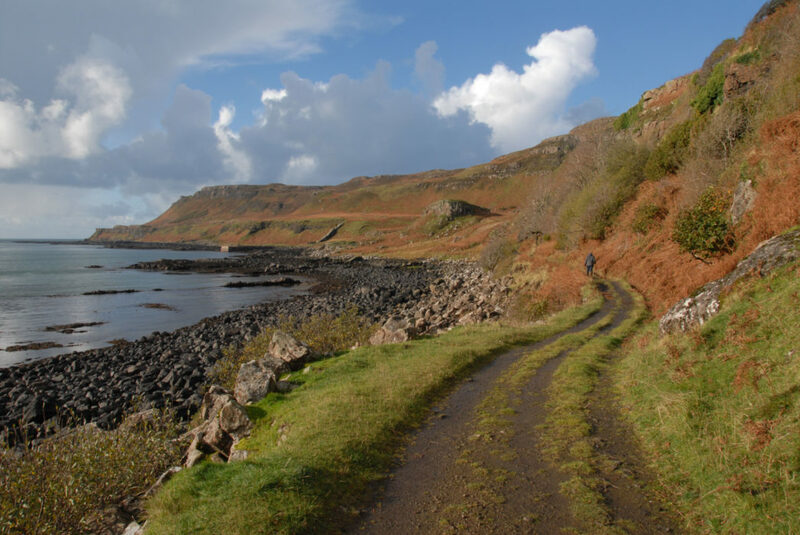 At its narrowest, Mull is a mere 4.25km (2½ miles) from Salen Bay to Loch na Keal at Killiechronan. And around the coast lie numerous islands. 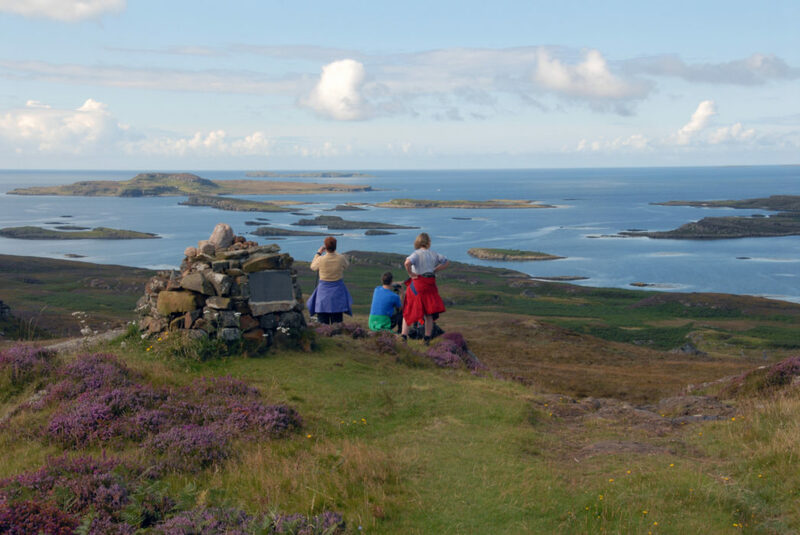 Mull is not so much one island as an island group; some, Ulva, Gometra, Erraid (which featured in Robert Louis Stevenson’s Kidnapped) and Iona, have interest for walkers. Others – Treshnish Isles and Staffa – are the stuff of legend and music, and popular on the tourist and wildlife trails. Geologically, Mull’s origins are violently volcanic, but dramatised in a complex evolution. 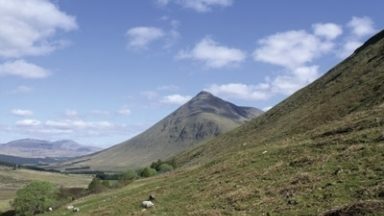 High (and not-so-high) mountains, remote glens, coastal paths along raised beaches, forest walks and island treks make Mull one of the most resourceful of the Scottish islands especially for the walker and wildlife watcher. Although a great deal of the coastline is rugged and rocky, in the south-west there are splendid beaches of glistening shell sand set against machair lands and sheltered crofting communities. But Mull and its islands are not to be consumed in haste. Even visitors with minimal interest in the natural world will find themselves stopping by the roadside to admire the wildflowers or watch the otters and the eagles. 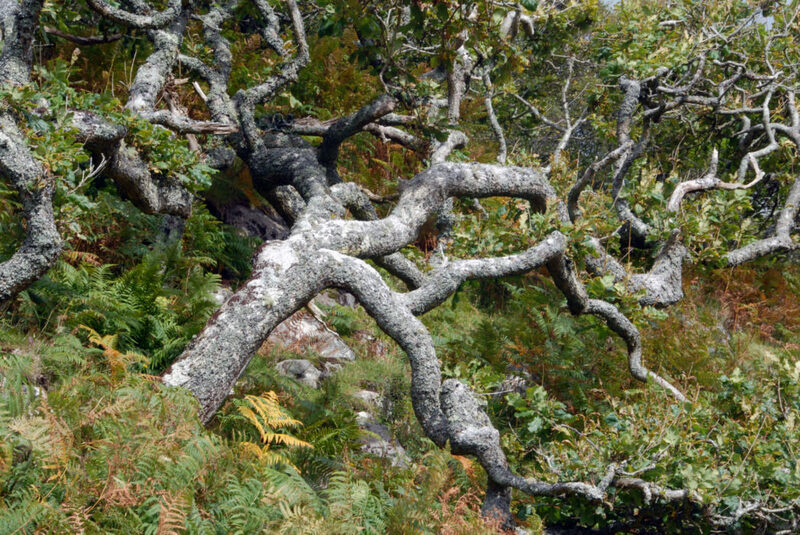 For such a small island, Mull is amazingly diverse in its plant life with more than 4,000 different species. There are no fewer than 800 flowering plants and conifers, almost 250 different seaweeds, 60 ferns, just under mosses and liverworts, almost 700 lichens and almost 1,800 fungi…enough to keep botanists enthralled for a lifetime. 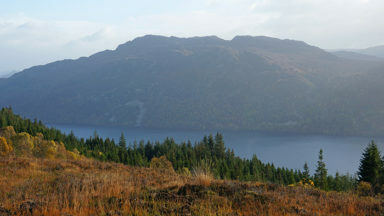 Sometimes it can seem as if all there is is a great mantle of bracken and heather. 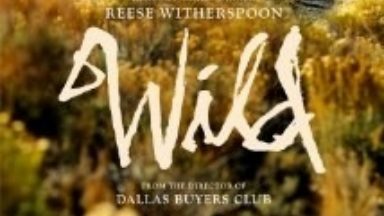 But that is only part of the story, and each season brings its myriad varieties from the wild daffodils, bluebells, primroses and violets of spring, to the winter deep greens; from the swaying foxgloves, orchids and harebells of summer to the gold of autumn. Wherever plants can grow, they do: Grass of Parnassus, tormentil, asphodel, scabious and cotton grass brighten the moorland bogs, while even the mountain peaks yield gentians and alpines. 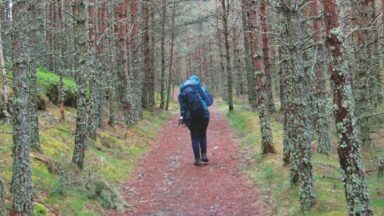 There is much commercial forest on Mull mainly featuring Sitka spruce, Japanese larch and lodgepole pine, but there is also an abundance of deciduous trees like birch, oak, rowan and wild cherry. And the wildlife of these islands is every bit as varied. On another visit to Ardmore, we were ambling along the forest trail to the lighthouse, and, as we rounded a bend, came face to face with a herd of a dozen red deer hinds. They stopped and stared at us; we stopped and watched them; they snorted a greeting; we snorted, too...our respective breath clouds giving shape to the icy morning air with a shifting mist. It was no stand-off; just a serendipitous and precious moment between man and beast – the sort of thing that Mull does best. Red deer are seen almost anywhere and everywhere, with fallow deer populating the woodlands around Loch na Keal and Loch Ba. There are even wild goats, which keep very much to themselves among the coastal cliffs. Mull and Ulva also have adders and slow worms. Around the coast, you frequently see common seals and grey seals; dolphins, too, and whales are also often spotted, especially minke whales, harbour porpoises and bottlenose dolphins, which I've watched cruising up and down Loch na Keal more than once; on rare occasions you may be fortunate enough to spot killer whales (orca) and basking sharks. But perhaps more than any other form of wildlife, it is the otter that attracts most attention. Far from uncommon, they can be spotted around the waterline along the rocky shores or playing in the water a little further out, as we found at Ardmore Bay; you just have to be patient, although they even frequent the harbour at Tobermory. 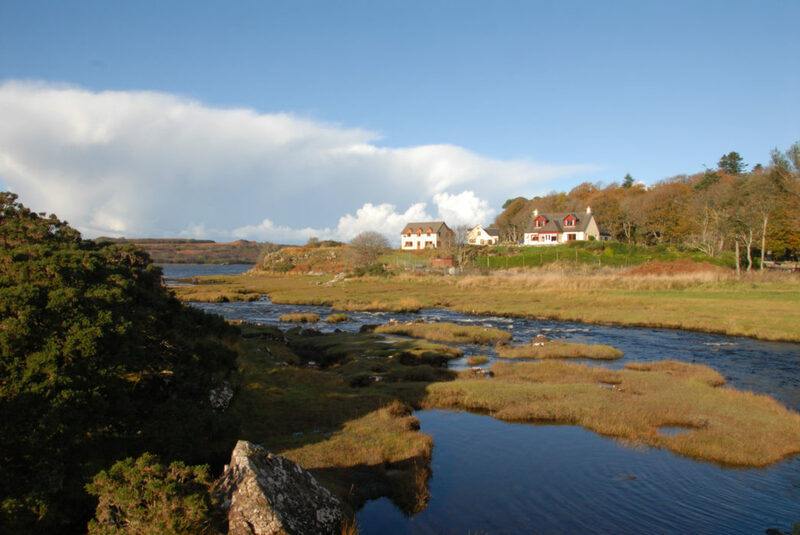 Surprisingly, perhaps, for an island so close to mainland Scotland, Mull is relatively undeveloped with few of the ‘town’ facilities and services of Oban. The island is best explored on foot, on a bike, or by car. But if you are planning to get around by car note that most of the roads on Mull are single track roads with passing places. There roads here on which it is safe to drive at high speeds, and the only dual carriageway is brief and single section, just south of Salen. That said, it is one of the continuing delights of Mull, that you can achieve quite significant circuits on its limited road network. But journeys will be longer than might be expected. From Craignure to Tobermory it is about 21 miles, but it is a journey that will take around 45 minutes; the road is good as far as Salen, but then becomes single track. Craignure to Fionnphort is 35 miles, a beautiful drive, but one that will take at least an hour. You come to Mull to escape, and to enjoy its fundamental simplicity, for that is its charm...that, and the ability to explore the winding narrow roads, all of them feeding into heathered and loch-filled glens, is the island’s greatest asset. Even on the gloomiest of days, the beauty of Mull will out, and the rewards for patience and persistence are memories that will last a lifetime and bring a joy that will make the heart ache. Oban is the main approach from the Scottish mainland; it is the rail terminus from Glasgow. A small ferry approach is possible from Lochaline in Morvern to Fishnish. 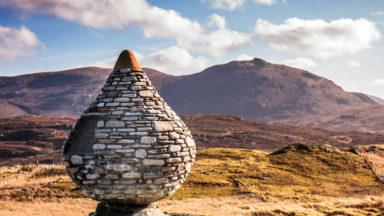 The most popular route from Glasgow to Oban is 160km (100 miles) by Loch Lomond to Crianlarich, and then via Tyndrum, where the road to Oban (A85) branches left to Connel and then Oban. The railway from Glasgow follows much of the same route as that used by cars and buses, although the early stages on leaving Glasgow differ until you reach Tarbert. For National Rail Enquiries, call 08457 48 49 50 (24 hours, seven days a week). See also www.thetrainline.com. Caledonian MacBrayne operate all the ferry services running to Mull (The Ferry Terminal, Gourock PA19 1QP. Tel: 01475 650100; Booking hotline: 08000 66 5000. You can also book online at www.calmac.co.uk) and frequent ferries to Iona. Ulva is reached by a two-minute crossing on demand – show signal at pier: Monday to Friday 0900–1700; also open Sundays 1 June to 31 August (Tel: (The Boathouse) 01688 500241; (Ferryman) 01688 500226); (Manager) 01688 500264) – and you can walk over the bridge to Gometra.